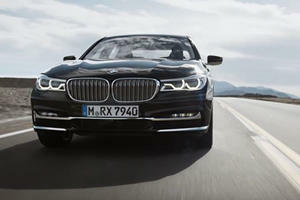 The new BMW 750i xDrive is a paradox. It has all-wheel drive and a twin-turbo V8 making 445 horsepower and 480 lb-ft of torque, which means the driver should have all the fun. But it also features enough tech and luxury to put a Silicon Valley hotel to shame. So why drive when you can sit in the lie-flat rear passenger’s seat and nap or watch a movie on the 10-inch touchscreen mounted in the front headrest? I asked myself that question a lot during the week I spent with this particular variant of the all-new 7 Series. The best way to describe BMW’s new flagship is “fun for the chauffeur.” Put another way, the ’16 750i xDrive is adept at disguising spirited driving. This is the kind of car where no one but the driver knows that it’s doing 100 mph. The only indication to those not in the driver’s seat of the sedan’s raw power is its brutal acceleration off the line. 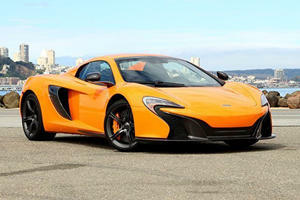 Despite dropping pounds thanks to the use of carbon-fiber-reinforced plastic and aluminum, the car still weighs 4,610 lbs. But it offers a surprisingly quick off-the-line experience, with BMW saying it’ll do 0-60 mph in 4.3 seconds. I didn’t use launch control or bust out my stopwatch but I'll say that from go you’ll be thrown back into the 20-way adjustable quilted Nappa leather driver’s seat every time. Needless to say, it's a soft landing. The two turbos quickly spool up, with not much in the way of discernible lag at any speed. Even with its twin-turbo V8 and AWD I didn’t expect the 7 Series to be so quick. All that power comes at a price, though, and it's paid in gas mileage. In Eco Pro my worst mpg average was 16 and my best was 21 mpg; the official split is 16/25/19. Basically, don't even bother trying to go green. Four driving modes are on offer: Sport, Comfort, Eco Pro and Adaptive. Adaptive is the most intriguing as it connects the eight-speed automatic transmission to the GPS, although I didn’t notice a massive change to the driving dynamics. Still, it’s cool to see tech formerly only available in Rolls-Royces make its way down to BMW. Inside the cabin almost no outside noise gets in and the drive experience is akin to hovering above the pavement thanks to the two-axle self-leveling air suspension and BMW’s Dynamic Damper Control. If so desired, you could quietly cruise on up to the electronically limited top speed of 130 mph without anyone in the car noticing. However, driving the 7 Series in a straight line isn’t all that fun due to this cloistering effect. Fortunately it’s actually not so bad once the road starts winding. Of the $30,850 worth of options my car had—it stickered at $129,245—the $4,100 Autobahn Package is the most valuable to drivers. The Autobahn Package adds Integral Active Steering—aka active four-wheel steering—and Active Comfort Drive. With the latter the car’s many cameras are used to scan the road ahead, with the dampers adjusted accordingly. In addition to creating a smooth ride the system works with the Active Roll Stabilization tech to keep the ride level. With the Autobahn Package the 750i xDrive is as fun to drive as any car of its size could reasonably be, save of course for its Alpina and M Performance siblings. I wasn’t reaching for the paddle shifters at the sight of every corner remained in manual mode on curvy roads more often than not. The steering feel was somewhat lacking but I don’t fault BMW for making it on the lighter side. No one wants to actually feel like they’re driving a car that’s as big as this is; it's actually an inch longer than its predecessor. Speaking of big, the ventilated discs on all four wheels came in handy big time (pun intended) when a straight road decided to turn right all of a sudden. Yes, the new 750i xDrive is actually a car you can drive but let's be honest: Tech is the big attraction here. A week wasn't long enough to fully explore all of the gizmos and gadgets, including the touchscreen Display Key which I didn't get to try out. It doesn’t help that the owner’s manual has as many pages as the Old Testament. Passengers didn’t really know what to do with themselves once they got into the massive rear seats. They all eventually got comfy and started playing with the tablet and touchscreens, but this is definitely a car that requires some studying whether or not you're driving. That being said I found the latest edition of BMW’s iDrive infotainment system incredibly intuitive and easy to use. 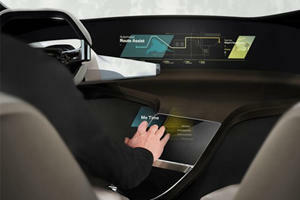 For the first time BMW is offering iDrive with a touchscreen. I used the excellent scroll wheel to navigate all the menus but touched the screen a few times when playing with Gesture Control, which still needs some work as hand movements aren't read 100% of the time. Still, when it works you get a cool glimpse into a future where calls are answered with a swipe of the hand and the stereo’s volume is raised or lowered with the twirl of a finger. Speaking of future, the head-up display in this car should be the model for all automakers going forward. It takes up a perfect portion of the glass and has a crisp display. All the safety features you’d expect are present and accounted for, with warning alarms alerting you to everything from a car in the lane you’re trying to merge into to a butterfly that’s impeding your parallel park job. I could go on about the safety features...or I could talk about that rear lie-flat seat. Said seat isn’t quite a bed but for someone standing 6’1” the option to fully stretch out and put my feet up was a welcome one. From this vantage point it’s easy to sit and drink in the luxuriousness of the cabin, marveling at the wood, leather and programmable lights. Or you can stare out the panoramic moonroof and doze off. Aside from the driver’s seat this is the best place in the 7 Series to be. And that brings us back to the paradox. 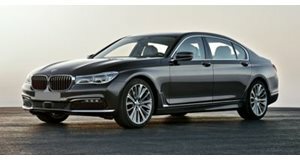 The 750i xDrive is a gorgeous car that cuts an imposing figure. I was in awe of its looks more than a few times. But this is as much a car to be seen in as to be seen driving. So what option should you go for? I logged almost 500 miles and never once dreaded driving, whether I was facing rush hour traffic or a long trek to San Francisco from Big Sur. Driving the 2016 750i xDrive isn’t quite like being in the cockpit of a fighter pilot, but it’s a lot more comfortable than the captain's chair on a Boeing 737 and engaging enough to make you want to skip your first class pod. BMW reminds us just how special its flagship sedan is.